Smart Money Heading Back into Gold? "...The current lull in the gold market may signal a great chance to buy before the price moves sharply higher once more..."
WHAT YOU MAKE of the gold market right now depends on what you make of the kind of data UBS's precious metals team follow. Big institutional players in the New York futures market slashed their bullish betting on Gold in the week to June 10th. Data from the CFTC – the US regulator – shows a net reduction of 11% in the long gold positions held by what it calls "large speculators". And this "reduction in the gross longs maybe a further sign that gold is losing its attraction," reckon analysts at the Swiss banking and wealth management giant. But less pressure from large investment funds could alternatively signal more loss of froth from the gold market since it shot 54% higher in the seven months to mid-March. Topping out at a new all-time record above $1,032 per ounce – just as the Federal Reserve lent $29 billion to support J.P.Morgan's fire-sale purchase of Bear Stearns – the Gold Price has gone on to drop 15% of its value against the Dollar. Versus the Euro and British Pound, the loss has been just as dramatic. And looking at the technical action on its charts, "any meaningful bounce from the 200-day moving average could bring back a lot of money into gold," the UBS comment goes on. That's what "happened last year," it adds. The 200-day moving average, as the name says, measures the average price of an asset over the last two hundred days. It's called "moving" because, as time rolls ever onwards, so too does the average – used by chart-loving technical analysts to see what the deeper, underlying trend is up to. And why 200 days? Because that's roughly the number of trading days during one year. So the chart here, therefore, shows both the daily Gold Price as well as its 12-month trend. And you can see how the 200-day average has indeed acted as "strong support" during the bull market so far. Well, kinda. Most of the time. Nine times since Gold quit its 20-year bear market in 2001, the price has either bounced off or moved sharply higher through its 200-day average. The following surge – lasting an average of 21 weeks – delivered a 28% gain before the price of gold tipped lower again, back towards that ever rising up-trend. The leap starting in late Sept. last year was the most spectacular, as UBS notes. 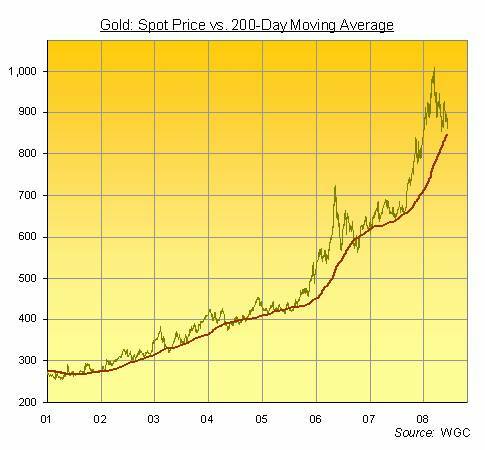 By the top of 17 March 2008 , the Gold Price moved some 54% higher. Might that happen again now? Pre-Empting the Bounce – prior to last year's jump – sparked by the US Federal Reserve slashing the cost of borrowing below the rate of consumer-price inflation – the Gold Price had dipped below its 200-day average seven times during this bull market so far. Buy Gold now, in other words, and a keen market timer might well have to endure a further drop first, even if the apparent magic of the 200-day average does come good once again. But with the 200-day moving average now just above the $850 level, longer-term investors who've been considering a purchase – but were put off the huge volatility of 2008 to date – might want to stop waiting around. Precisely because larger investors are sitting it out, and precisely because technical analysts like the UBS team are pointing to a possible dip before advising you buy. You see, that price of $850 marked the bottom of gold's fast & furious sell-off in March. It was also the previous bull market's top, hit just as Soviet tanks rolled into Afghanistan on 21 Jan. 1980 . So a return to prices below that level might actually signal a longer term drop. If the price is to push higher from here instead, a drop below $850 might be a long time in coming. Hanging on for another pullback from today's current Gold Price and so trying to nick a little extra off your investment outlay might prove expensive, in short. If you're looking to take a position in Gold for longer-term or deeper fundamental reasons, the kind of low-profile flat action we're seeing this June could offer your best chance to get in. Just ask anyone who tried to wait for a pullback once the last surge in Gold Prices had started in Sept. '07.